Other projects in the works this week, a Fairy Tail spin/swap. Super fun! I'm just ready to begin spinning, can't wait! The big reveal will have to wait until it's been mailed off to my swap partner, but maybe you have guesses as to which fairy tale I was randomly assigned? I also knitted up another pair of sleeping cuffs, love the first pair, but wanted them longer. I did these in bulky weight and made a modification to the bind off cuff by knitting two together, then binding off. It created a nice cozy, slightly narrowed cuff that stays partially covering my hand unless I push it back. This is especially nice for sleeping, since the others tend to get pushed up when I'm sleeping. That just a little recap of my fiber activities this week, I look forward to checking out all the marvelous creations over at Andria's Fiber Arts Friday blog hop! I can't wait to see your crocheted project. I must check out the freeform crochet. Thanks for giving references of "pattern" writers and artists. I have a block on fairies but those colors remind me of The Little Mermaid. What an awesome swap. You are always out there on the edge creating something totally unexpected and beautiful! Oh, and the cork is a great idea to keep those points sharp. Really beautiful and look forward to seeing the purse finished. The fibers look fun. Love your sleeping cuffs. Your purple scrumble is looking scrumptious!....what a piece of art. Melissa--Your scrumbles are amazing! I know the bag is going to be wonderful. 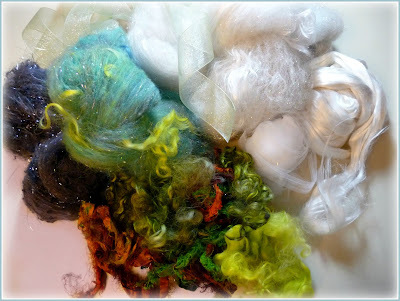 I've heard that you can also use them in felting for a really interesting effect! Free form sounds pretty fun! 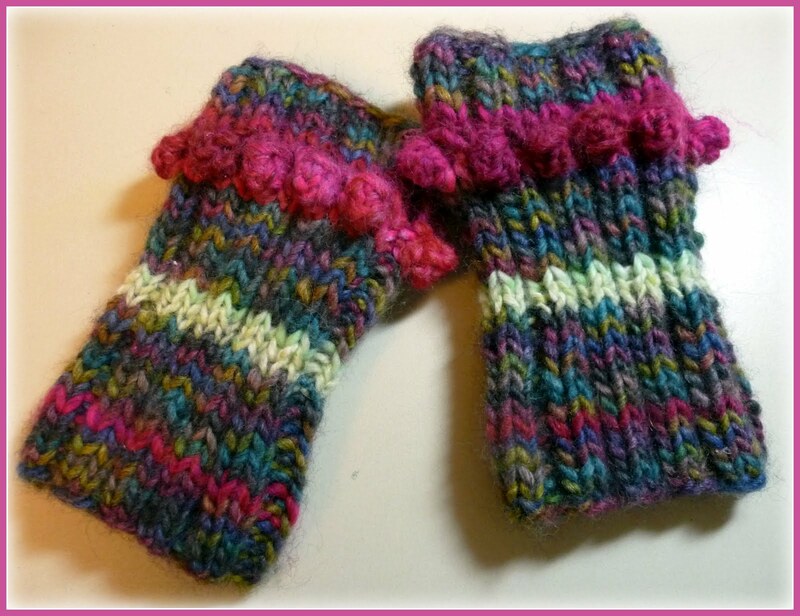 I love the cuffs you made, the yarn is just gorgeous. LOVE freeform and wasn't aware of the term scumbles... it's way better. It's lovely so far. 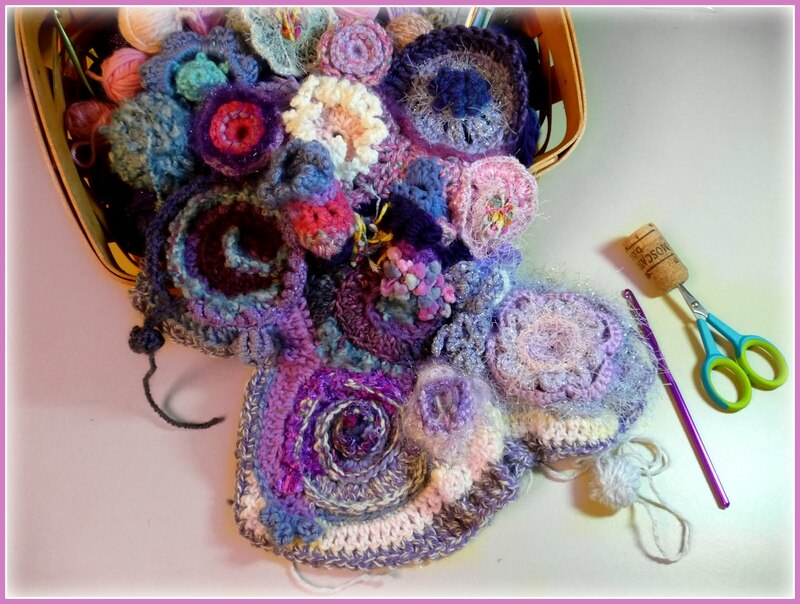 I love freeform knitting/crochet, a great way to let the creative juice flow. Look forward to seeing yours! Hi there-thanks for the comment on my blog-I have a Lil'Dynamo box picker-it works pretty good-I still have to card or comb the wool-it doesn't quite get it perfect for spinning-but it breaks up the locks and clumps pretty good. And I do believe we are in the same fairy tale spin swap--its fun. Some day I want to learn how to scummble, too.